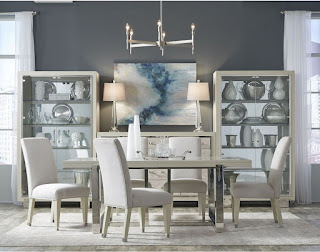 This 5 Piece Set includes a dining table, two metal arm chairs and two metal side chairs. Matching Buffet and Server are also available. The Cydney Dining Collection by Pulaski, has a minimal design with a light finish which makes a perfect furniture piece for modern homes. The table has a robust metal base and two 18" leaves extends to 114" which make a stylish combination to highlight your living room. The chairs complete the look of this set and make a great gathering spot. These chairs have upholstered seats and backrest which ensure a comfortable seating and optimum support to your back. It has a cleaning symbol “S” which indicates that 100% polyester upholstered seats and back must be dry cleaned.